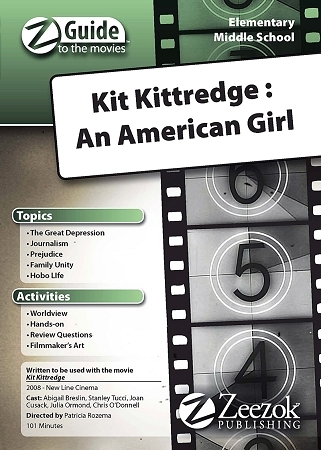 Zeezok Publishing's Z-Guide to Kit Kittredge is an original way to incorporate media into your study of the Great Depression. This guide contains a topic overview movie synopsis and ten learning activities based on this family-friendly film. Learn more about the hardships families faced in the Great Depression. Decipher coded messages using hobo signs. Design your own Depression era fashion show. Be a journalist like Kit and write a newspaper article. Play Who Am I? with your family and friends. Learn Depression-related vocabulary. Distinguish irony from foreshadowing. Determine whether prejudice is ever acceptable. Share personal responses to the For Family Discussion questions and experience life in middle America during the worst economic depression in American history. Movie Summary: Kit Kittredge and her family are simply trying to get through the hardships of the Great Depression in Cincinnati Ohio. In addition to finding ways to save their home and reunite her family Kit solves a string of robberies that have been blamed on the hobo community. Moreover she develops friendships with a variety of unique characters along the way. Kits clever thinking and plucky spirit and the many adventures she encounters with her friends make this movie (based on the American Girl book series) a delightful choice for the entire family. Topics: The Great Depression Hobo Life Journalism Contains a printable pdf file of the complete study guide. It does not include the movie. This Z-Guide is based on the movie Kit Kittredge (2008). You can view a trailer for the movie below.